The Spaceman 6695H – High Capacity, Dual Flavor Counter Top Frozen Beverage Machine is Ideal for Frozen Beverages, Slush Beverages, Margaritas, Smoothies, Shakes and Frozen Coffee Drinks! 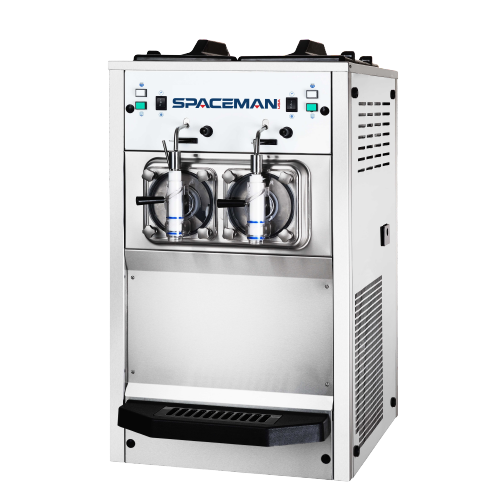 The Spaceman 6695H is a two flavor frozen beverage machine great for high volume applications. Pre-cooling in the hopper means that this model is approved for dairy, so it is extremely versatile! Dual controls allow the operator to serve different products from either side of the machine, varying the menu with yummy options like milkshakes, smoothies, frozen coffee drinks, margaritas or slush. The convenient counter-top model is good for gas stations, restuarants and bars, mobile units or catering businesses. The hopper agitator will stir product throughout the day, saving time and ensuring an even cool in the hopper. Patented freezing technology makes for a super fast recovery time in the 7.3qt cylinder, producing 80 qts/hr or 320 drinks every hour. Vary your menu by offering shakes & smoothies or fruit juices, coffees, cappuccino and tea slush beverages, all served at the desired thickness.